We finally started hiking up the Taboose Pass trail at 10 am and it was already too warm for an uphill, shade-less trudge. The Taboose Pass trailhead starts in the desert, so an early start to beat the heat is recommended. As we climbed up the trail, Corrine felt a little nauseous from the heat. We pressed on until we got to the first shady spot next to the creek roughly 1.5 miles into the hike. After this nice shaded spot, the heat was less oppressive and hiking went smoothly to the pass. We camped just before reaching Taboose Pass itself, behind some rocks to avoid the cold breeze. Taboose Pass is a barren wind-swept place. Not a great spot for camping, but it is a good basecamp from which to begin climbs of Goodale and Striped Mtn. Early next morning, we started off for Goodale first. From Taboose Pass, we went left of the summit ridge into a rocky basin and climbed to the saddle between Goodale and Striped. We headed left up towards Goodale, climbing the steep slope just right of the southernmost of two prominent pinnacles on the peak. The southernmost pinnacle, similar in height to its neighboring northern pinnacle, was the one we climbed first and had the register. Only the last 20 feet or so was class 3, and easy class 3 at that. We then went over to Striped Peak, following the ridge that connected it with Goodale. Striped Peak was the more interesting peak, with its multi-colored rock. It also had the better view. Photo 1: Corrine hiking towards Striped Mtn. Descending close to the route we went up, we were back at our packs before noon. Starting down into the King's River basin, there is a trail junction less than a mile from the pass. The right fork provides a more direct route to Upper Basin. Unfortunately, the Park Service had recently dumped a bunch of rocks in this side-trail to discourage hikers from using it. 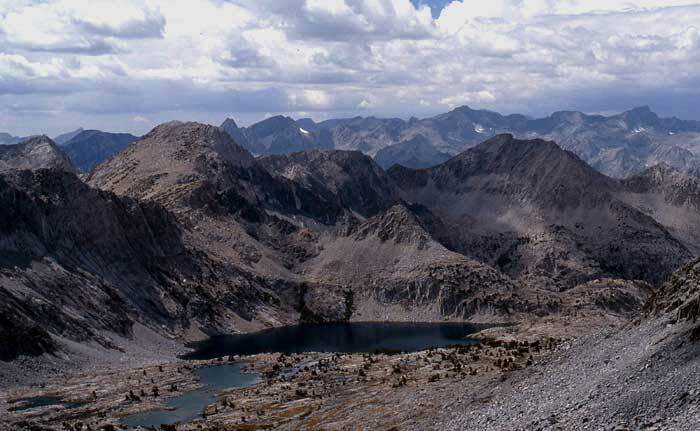 The alternative is to hike the main Taboose Pass trail in the direction of Bench Lake where the trail intersects the JMT at a lower junction. We chose the old side-trail, which was still quite visible in 2007, and saved us over a mile of walking and a significant elevation loss. We found a campsite just off the JMT right at the edge of the forest in Upper Basin. We ran into Greg Vernon on the JMT. 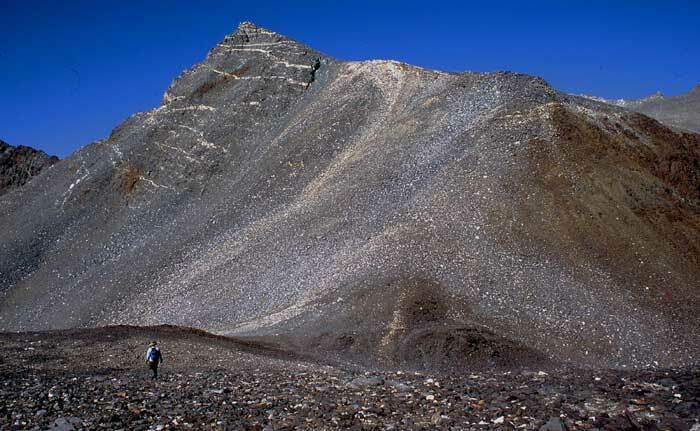 When we described our plan of climbing Observation Peak via little-known Amphitheater Pass, he thought we were nuts. He had never heard of anyone climbing Observation from Upper Basin. And this from a guy who has climbed nearly every peak on the list 3 times. Well, we knew it should work. Clouds were moving in fast and thick this afternoon, with showers falling on nearby Split Mtn. It all had the look and feel of a monsoonal system moving in. A midnight thunderstorm hit the Taboose Pass area, but our campsite was just outside its sphere of influence. We woke up the next morning to heavy overcast and threatening rain. We wanted to climb Observation today, but should we go? We decided to hike to Amphitheater Pass and then decide there. I had wondered for sometime if Observation peak was reachable via this pass. It is not mentioned in RJ Secor's Guidebook, 2nd edition. [However, it has since been listed in RJ's 3rd edition] I found one trip report by Greg Gerlach that said this pass goes. In fact, it was Greg that had gave the name Amphitheater Pass. Photo 2: Map of route from Upper Basin over Amphitheater Pass, and on to Observation Pk. We hiked to the lowest point on the ridge, which went class 1-2. Looking west from the pass, the overcast sky did not look good. It could start raining at any time. After some thought we decided to go for the peak, with the idea we would turn around if it really started raining. The good thing about overcast skies in the morning is that it keeps the temperature on the cool side...less chance for thunderstorms developing early in the day. From the low point in the pass, we moved right (north) about 20 feet and started down the steep, rocky west side of the pass. After descending close to 100 feet, we followed a ledge that went right (north) and dropped us into a large scree-and-boulder filled chute. This chute, as it turns out, is the largest chute on the west face of the Amphitheater Pass ridge. There was no indication anyone had been here before, so I left a few ducks to help guide us back to the right ledge system. Done right, this route goes no worse than hard class 2. We dropped down through some large boulders to the first high tarn, then stayed north above the chain of lakes in the basin as we moved almost directly towards the outlet of Amphitheater Lake. Descending closer to the chain of lakes would have lead over several cliffy sections that we wanted to avoid. This was an easy, enjoyable ramble through classic Sierra alpine terrain. And there were only a few very brief, light showers during then descent. At the Amphitheater Lake outlet, we circled around to the lake's NW side and scrambled over some large boulders that led to a vague use trail gradually ascending the steep slope on the west side of the lake. The trail led to the top of a green strip of vegetation that emanates from a flat area. The green strip hides a small stream that drops into Amphitheater Lake. From the flat area on top, we could now see Cataract Creek Pass. Because this was late season, the fabled snow cornice on the pass was very small. We could squeeze just right of the snow and keep the climbing to class 2. This pass, when the snow cornice is nearly non-existent, seems to me to be one of the easier cross-country passes in the Sierras. Photo 4: Corrine reaching Cataract Creek Pass. Palisades in background. Once over the pass, we circled around the steeper SE base of the peak until we could begin climbing class 2 sand and boulders. We climbed onto the east ridge and followed it avoiding a big patch of scrubby whitebark pines growing on the peak. However, near the summit, we passed through an almost impenetrable section of whitebark pine on the ridgeline, which we didn't want to revisit during our descent. The summit was reached a little before 11 am. 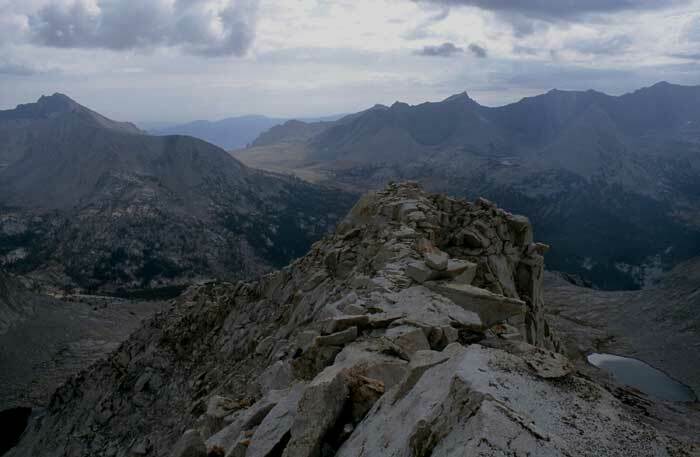 It felt good to finally climb Observation Peak, one of the more remote peaks in the Sierras. There's a nice view of Devil's Crags and the Palisades from this vantage point. We didn't stay long because rain was still threatening. On the descent, we passed to the right of the big patch of whitebark pines. This worked out much better than following the east ridge going up. We were able to find our way back over Amphitheater Pass and back down to our camp without the clouds dropping any significant rain. Only once did we take out our rain jackets, only to have the rain stop as soon as we put the jackets on. Our total time for this wonderful, but seldom used, approach to Observation Peak was a little over 9 hours. I would highly recommend this route to Observation Peak, particularly for climbers planning to climb other peaks from the Upper Basin area. During the night, another midnight thunderstorm rumbled its way up the King's River drainage. This time, the edge of the storm just reached our campsite pelting us with rain for a short time. I had been sleeping under the stars during the trip, but had to relent this time to the storm and duck into Corrine's tent to stay dry. Early Wednesday morning, the skies were mostly clear, but the air felt muggy. The air had the feel of thunderstorms coalescing by noontime. Corrine and I climbed different peaks today, she going north for Mt. Bolton Brown and I going south for Mt. Ruskin. For Mt. 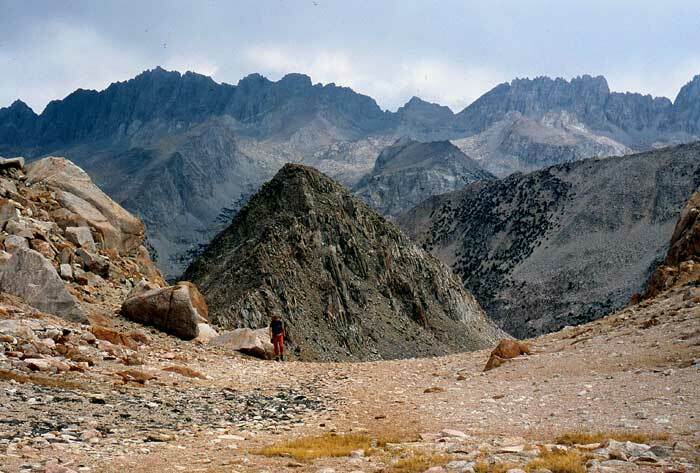 Ruskin, I hiked back down the JMT for about one mile, then struck off cross-country towards the basin under its southeast face. I passed below the rock formation called The Saddlehorn on the way, which could easily be mistaken for Ruskin. Climbing up into the correct basin southeast of Mt. 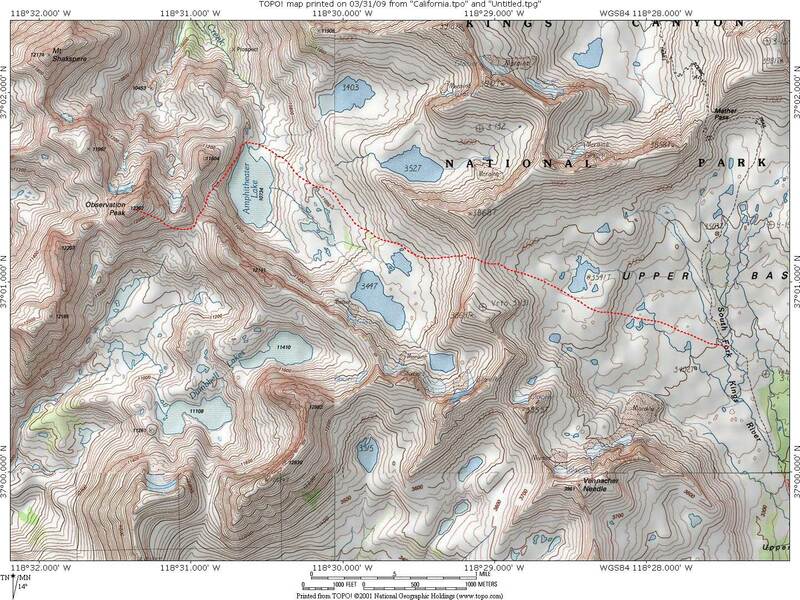 Ruskin, I passed north of the shoreline of Lake 11,520+ ft towards some small tarns farther up. I then turned north up a ramp leading up to the imposing cliff-face under Mt. Ruskin's east ridge. An obvious up-and-right leaning ledge can be seen from here on the face. Once on this ledge, I soon came upon a line of ducks that led nearly to the end of this ramp, and then led up onto the east ridge. The east ridge has marvelous views all around the Taboose Pass area and is an enjoyable climb. Near the summit, I reached the crux of the climb, which is given a class 3 rating in R.J.'s Guidebook (2nd edition). It is a short climb up a crack on the north side of the ridge. However, I would give it a class 4 rating...I have done stuff rated class 4 that was easier than this! It was about this time Corrine and I had our scheduled radio call-in to each other. On the radio, she said she was nearing the summit ridge of Bolton Brown. Later on back in camp, Corrine reported the south face of Mt. Bolton Brown was class 2, but thought she got into a little class 3 just before reaching the summit. Back on Ruskin, once I got beyond the crux move, the summit was only minutes away. The clouds were gathering quickly, so I did not stay long on Ruskin. I made it back to camp only 20 minutes before Corrine, and none too soon. A thundercloud enveloped the Mather Pass area just after noon time and dumped massive amounts of hail on the slopes of the pass. Within five minutes, the hail turned the entire slope absolutely white! We were right on the edge of the storm and being pelted by big raindrops, so we quickly packed up and headed back to Taboose Pass. We wanted to hike down about 1.5 miles on the east side of the pass to some nice camp spots on the south side of the river. However, the camp area was absolutely overrun with other campers! I was surprised by the mass of humanity here, because the difficulty of the Taboose Pass trail normally keeps it relatively hiker-free. We ended up camping lower down about 3 miles from the trailhead. 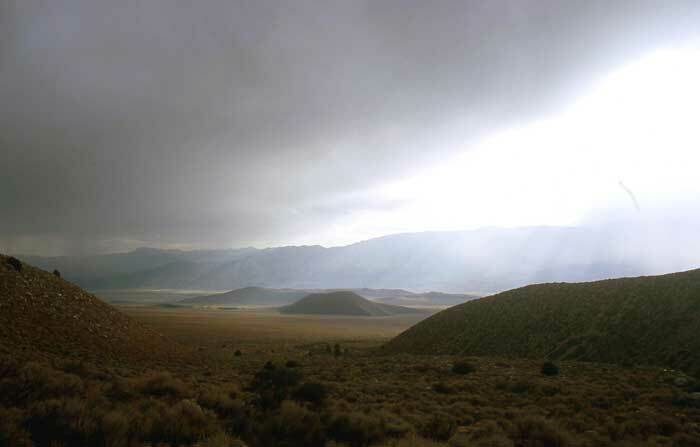 On our way out the next morning, we were treated with a magnificent view of a thunderstorm moving up Owens Valley. A beautiful view of a thunderstorm indeed, considering it wasn't over us!